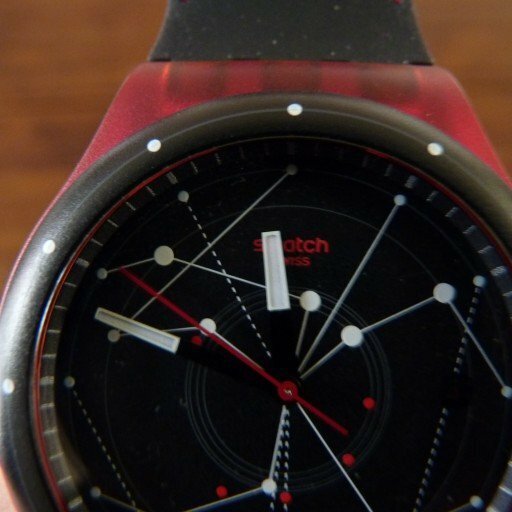 As watch nerds you will all have probably heard about SWATCH’s release at last years Baselworld of this particular and revolutionary watch. Today I will be taking a look at a Sistem51 hands on, and giving you my first impressions. 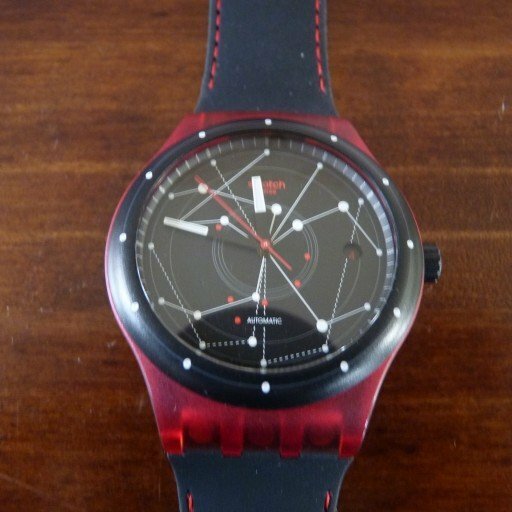 This watch was released for sale in week 51 of 2013, only in Switzerland, luckily for me I have a friend to thank for their assistance in getting one to me! The front tells the time, the back tells a story. 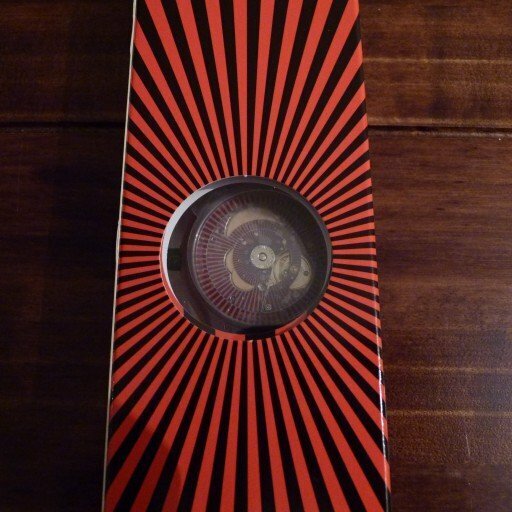 Further emphasised by the packaging, a cardboard sleeve with a striped design reminiscent of ‘Geneva stripes’ in alternating colours. This particular model is a red and black variant as can be seen here. 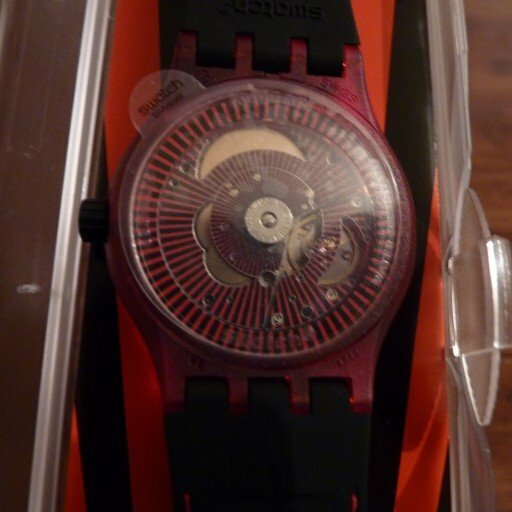 A plastic case houses a fully automatic movement consisting of only 51 components. Made from an alloy called ARCAP, consisting of copper, nickel and zinc, gives it anti-magnetic properties. Here are some technical specifications that really underline the technological feats that SWATCH have put into this piece. Such as a power reserve of 90 hours, hermetically sealed case and all the components in the movement fixed on one screw in the centre. Yes just 1! It is visible through the clear plastic case back, this is important enough that the packaging has a hole in it to show it off in all its glory. The lack of a visible semi-circular bi-directional rotor does not mean that this automatic movement is not wound in the usual way, instead it is the rotor that is different. The rotor is a complete circular piece of plastic that is transparent, allowing for a clear view to the movement, and the weighting is at the periphery. The weighting is set on the periphery but only weighted on half of the disc, this can be seen through the translucent watch case, so in essence this is exactly the same as the usual rotor in most automatic movements, it is just dressed differently. 42mm case on the now famous three pronged SWATCH rubber strap means this is definitely on the larger size of my preferred watch sizes, but hey 42mm is certainly the ‘fashionable’ size at the moment. As a casual watch this will be the perfect size for most. The accented stitching on the rubber strap adds a small detail and continues the colour combination used in the case and the dial. The dial is a little busy with it being inspired by Copernicus’ idea of the solar system orbiting the Sun and not Earth. It may be busy, but it is still relatively easy to read due to the wide hour and minute hands. Before I forget, there is a date window at the 3 o’clock position. Ominously the famous words ‘SWISS MADE’ are missing from the dial, however, under the big SWATCH logo there is the word SWISS, so maybe that will have to suffice. It also says ‘water resistant’ on the back but it does not state to what ATM or depth, which I find very interesting. We are all very good at attaching numbers to values, making them quantifiable, strangely it even comforts us. In this case SWATCH has foregone that completely! Maybe they assume that no serious diver in their right mind, will ever wear a Sistem51 to any diving sessions, let alone to a reasonable depth. Either way, that may turn out to be incorrect as to me, this watch is very desirable and to us watch nerds, undeniably cool. This is an accessible bit of wrist candy! Next time a full on womw review.